Last Friday night mom went to a fundraiser for the rescue that we help by fostering kittens. The main goal of the rescue as always been TNR - Trap Neuter Return. Well, the rescue was approached by a local artist about doing an area specific fund raiser. She would get artists in the area (and out of the area as it turns out) to donate cat art work. The funds raised would be used for targeted TNR in the area around the art studio. The woman who headed up the fundraiser said she learned about feral cats and TNR when she moved to the area and discovered "wild cats" living in her backyard. After some research, she discovered Colony Cats and reached out for help with TNR. She now cares for that colony, but it made her aware of the issue and she kept seeing more and more cats around the area where her art studio is located. She decided to go with what she knows and raise money using art to help the cats. Mom saw several art pieces being purchased that night and the sales will go on through the end of the month. Mom bought a small magnet from an artist shop but didn't buy anything for sale from the fundraiser. It was crazy busy and crowded so it was pretty hard to see everything too. But it was wonderful to see so many people come out to support cats and art and the rescue. The rescue brought some adoptable kittens and some cat toys to sell as well. It certainly gave us something to think about. So often there are auctions or raffles or just pleas for funds for non-profits. But this was a pretty unique idea and we hope that other groups will think outside the box for fundraising. What a good idea for a fundraiser - we hope you get many $$$$$. That was a great idea. All of the art if gorgeous too. How cool is that! A fantastic idea, and I hope it raises a ton of $$$ for the rescue! We must get the word out about TNR! Great idea! Too bad we can't look at and maybe buy on line. What an awesome fundraiser! We've had artists in our area put on events to benefit rescue too. Great idea! When TW went to the Paw Fest in October, they had a section with art for sale drawn by kids at a local school. What an awesome fundraiser - arts and cats are the purrfect combo! That's really cool, and I'm glad so many came out in support of the rescue! The shelter I used to volunteer with has an event called "Tails of the Painted Cats" where they hold a gala dinner and auction. They auction off big cat sculptures, cat paintings, kitten paintings (where kittens have painted things with their paws), and cat pottery. It is a really fun event. I hope that more rescues and shelters will do some cool things like this - it really brings together the community for a great cause. I'm seeing so many creative ways that organizations are helping animals! Like you I'm so glad to see people thinking outside the box. I think there are so many causes it's very hard to choose where to help. Creativity will play a key part in showcasing these fine organizations. Thank you for supporting BTC and for joining the blog hop! What a great way to raise funds! Awesome! Such a great idea for a fundraiser...thanks for telling us about it! The art is amazing...and it's a wonderful way to raise $$. That's a great idea and a great cause! win win!! What an awesome and creative fundraiser! We hope it was a huge success! now that's one art show we would LOVE to attend!! That's a pawesome idea! Wow! There are a lot of great pieces in the fundraiser. I hope they get all sold. 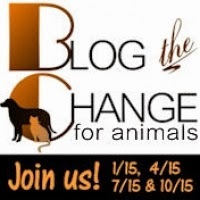 Thanks for sharing and thanks for joining in Blog the Change! That is some very nifty artwork! What a great idea! Interesting artwork there, too... I love how the organization places a priority on TNR, it's so important. And it's so heartwarming to hear how that woman not only learned about TNR, but is actually doing what she can to help ferals in her area. Awesome!